April 16, 2019 – While state and federal officials are looking ahead and worrying about the coming fire season and how to more quickly get in front of fast-moving blazes, a University of California, Berkeley, professor argues that the tools for rapid detection are already here. A weather satellite, GOES 17 (GOES West), sits above California taking photos every five minutes that can show hot spots throughout the West. If visible light and infrared data from this geostationary satellite are downloaded quickly enough, a computer program could easily be written to search for hot spots and alert emergency responders within as little as 15 to 30 minutes. Wildfire early warnings could even be delivered via a mobile phone app, just as apps today deliver weather alerts and, someday soon, earthquake early warnings. Chambers and a group of graduate students downloaded GOES 17 data days after the Camp Fire devastated the town of Paradise on Nov. 8, 2018, and were able to reconstruct the fire’s advance every five minutes for four hours after ignition. The images are low-resolution — each pixel is 2 kilometers square — but they could be used to quickly spot and track the spread of a large blaze almost in real time. 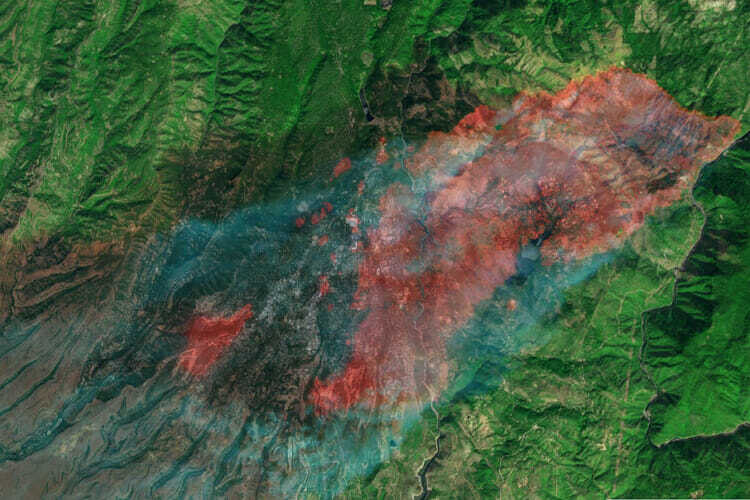 Another Earth-orbiting satellite, Landsat 8, takes photos of the Western United States every 16 days and just happened to snap a photo of the Camp Fire four hours after ignition, which by that time had burned halfway through Paradise. Chambers later downloaded those images, as well, and, with the help of Google Earth Engine and the algorithms he wrote, he could clearly identify the buildings that had already burned and see the rapidly leapfrogging flames. “At the time of the Camp Fire, we hadn’t yet built the tools to quickly synthesize all these data streams into a single application, but we’re there now,” he said. Today’s wildfires move quickly — at one point, the leading edge of the Camp Fire was advancing over an area of 200 football fields every minute — so a 15- to 30-minute delay in accessing and analyzing satellite data would be too long to forewarn those near the fire front. But 30 minutes of advance warning could jump-start fire and police response and allow those downwind of the fire to evacuate much earlier, Chambers said. Even better, he says, would be a geosynchronous land observation satellite dedicated to wildland fire detection, ideally with higher resolution than GOES. A dedicated fire satellite would not only enhance wildfire detection and monitoring, but could also track drought impacts, contribute to agricultural optimization efforts and assist with observation of land use and biomass change for carbon accounting, he said. Such a platform could help reduce impacts to the built environment and communities, while expanding the technology available to address today’s complex ecological and environmental challenges. A UC Berkeley team proposed just such a satellite five years ago, dubbing it FUEGO (Fire Urgency Estimator on Geosynchronous Orbit). That group, led by astrophysicist Carl Pennypacker, estimated a cost of more than $200 million, high enough to require state and/or federal assistance or private investment. Chambers’ analysis of the Landsat 8 and GOES satellite data from the Camp Fire clearly showed a fast-moving wildland fire, but not a forest fire, he said. Many trees survived the fire and looked green and healthy in satellite images taken weeks later, whereas chaparral and grasslands were completely consumed by the fire. “This fire was moving so fast through the city that, in many cases, it burned right through the understory, and there wasn’t enough contact to get the flames up into the crowns of trees,” he said. Any home or business surrounded by dry vegetation or downed or dead trees or that had gutters full of dry pine needles or leaves was vulnerable to catching fire, however. More than 10,000 structures burned in the Camp Fire. In an article posted online today and submitted to PeerJ, Chambers described the sources of data that he employed to study the Camp Fire and that could assist in detecting future fires, now that the data analysis tools are available.